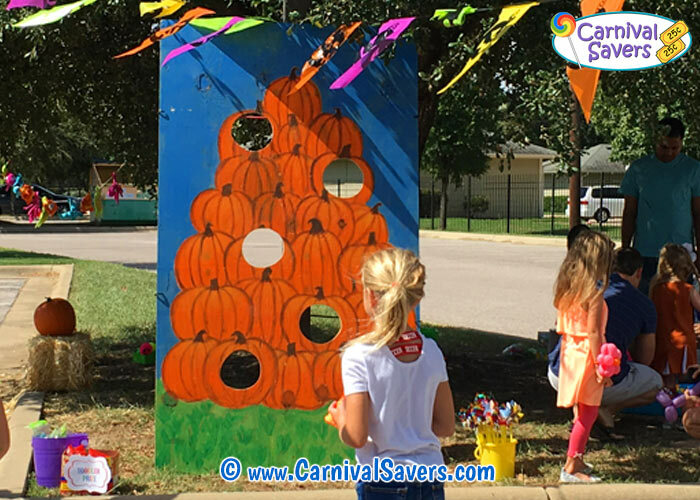 Fall Carnival Game - Pumpkin Bean Bag Toss! Size of Bean Bag Toss Game Does Matter! Small Set best for backyard parties or preschool kids. Carnival Prizes - consolation, medium and top carnival prizes!! Halloween or Fall- themed prizes are great fun!! Days before your event, take a large sheet of plywood, draw a fall type design and paint with acrylic paint, let dry. Have a woodworking adult use a jigsaw to cut 4 - 5 (6 inch or so) holes in your plywood for this game. Before the carnival, set up your game and test the bean bags and the stand for difficulty and place “stand behind” lines for different age children using sidewalk chalk or tape. 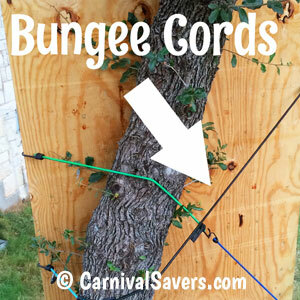 using bungee cords to prevent a breeze from knocking the board over! Children are given three bean bags to toss per game. Depending on the setup of this Fall game, they win prizes based upon how many bean bags make it into the mesh holder and total number of points earned. Of course, every carnival player wins a consolation prize! 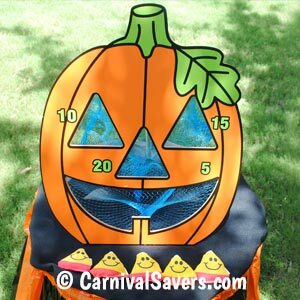 Note: This is a small-sized carnival game to buy that is fantastic for a backyard Halloween party or young children. 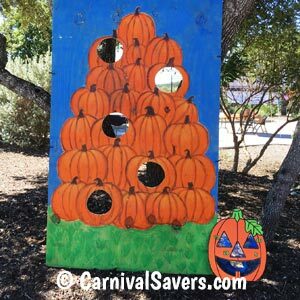 But, if you are planning a large fall event, this game may seem too small and it may be best to make the DIY Pumpkin Bean Bag Toss shown above. 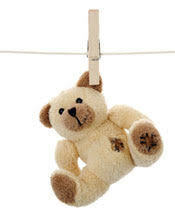 Don't miss our Carnival Supplies and see all our darling Halloween Prizes and Small Toys! HALLOWEEN CARNIVAL SUPPLIES and PRIZES for the PUMPKIN BEAN BAG TOSS GAME!